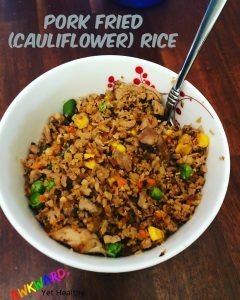 Gluten Free Pork Fried Cauli-Rice | Awkward; Yet Healthy. Pork fried rice is SUCH a comfort food to me! But between the Celiac and the Type 1 Diabetes, I can’t order it from many places, and if I do it’s going to e a blood sugar nightmare. Enter Pork Fried Cauli-Rice! This recipe is so simple, and like all of my Foodspiration ideas, totally customizable. I like the true American-Chinese food taste though, and this recipe is as close as I can get! Garlic. All the garlic. Or just 1/2 – 1 tbsp. Add the onion, garlic, and frozen vegetables into a frying pan with just a little bit of oil to keep from sticking. Sautee over medium heat until the onion is translucent. Add in the pork, cauliflower rice, and seasonings/ sauces to taste. Sautee until heated through and the cauli-rice is tender. Do not add salt. The soy sauce/ aminos will salt it enough for you. Mix in the egg and continue to toss all the ingredients until the egg is cooked through and spread evenly. You’re done! Minus the cooking of the pork, this takes less than 20 minutes. Gluten Free, Dairy, Free, and low carb. You’re welcome! Add in Juice Plus, and you’re good to go for a healthy day! One more tip for the pork, you can chop it by hand, in a food processor, a pulsing blender, or the sweet Tupperware chopper that I have.